Nassau, Bahamas – Bahamian Escapes Luxury Real Estate and Lifestyle brand, launched its newest digital magazine supplement on Tuesday November 8th, 2016. 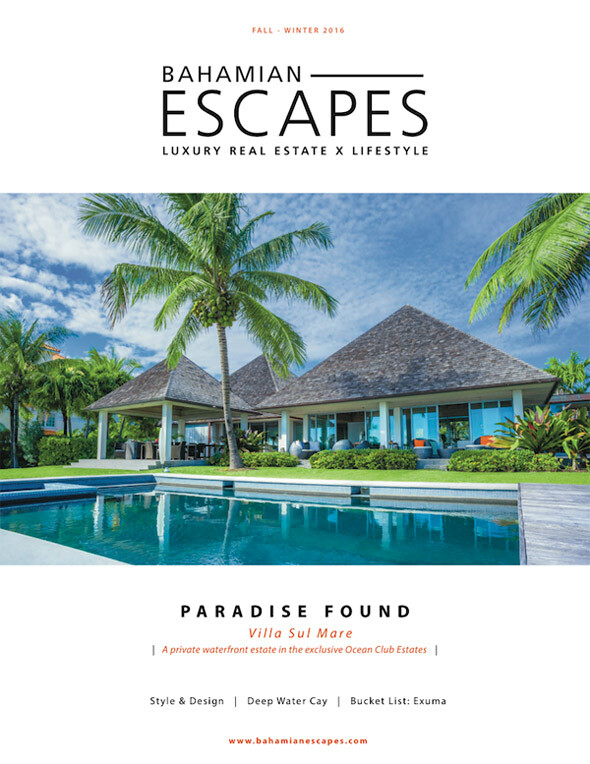 Fall/Winter 2016 issue of Bahamian Escapes Magazine features a fresh new look from cover to back and offers an exclusive look inside Villa Sul Mare, a tropical oasis in the swanky and ultra-exclusive Ocean Club Estates on Paradise Island. Subscribers will find real estate updates and the latest in interior design trends. From start to finish, the issue offers an exclusive look into the lifestyle of the affluent in The Bahamas. “Since its inception three years ago, Bahamian Escapes has grown tremendously from a stand-alone publication to an established business, showcasing and offering the best in Bahamian luxury real estate and lifestyle opportunities,” said Shamon Campbell, chief executive officer and publisher. “Through partnership with industry leading brokerage, H.G. Christie Ltd, the exclusive affiliate of Christie’s International Real Estate, we are now able to offer real estate services to our clients who find themselves captivated by the properties advertised,” said Campbell. Kendeno Knowles, editor-in-chief, said Bahamian Escapes’ evolution was inevitable with the ever changing trends of the real estate industry and to a larger extent the way of the world. “The way information is received and digested has changed over the past few decades and that notion has really been our guiding light of sorts in the way we have caused Bahamian Escapes to evolve. No longer is it just reading material, it has become a brand that simply embodies luxury real estate and the lifestyle that comes with it,” said Knowles. The new 68-page read marks the company’s seventh installment and features a diverse content offering with stories and other material related to travel and leisure.